One of the recipes that I keep getting asked for is a Cream of Mushroom Soup that doesn't come out of a can. I worked on this one for a couple of weeks, trying various recipes, until I created this recipe that not only has the taste and consistency of the soup everyone (who's had Campbell's soup) is familiar with, but also a wonderful freshness and flavor that can only belong to a homemade soup. 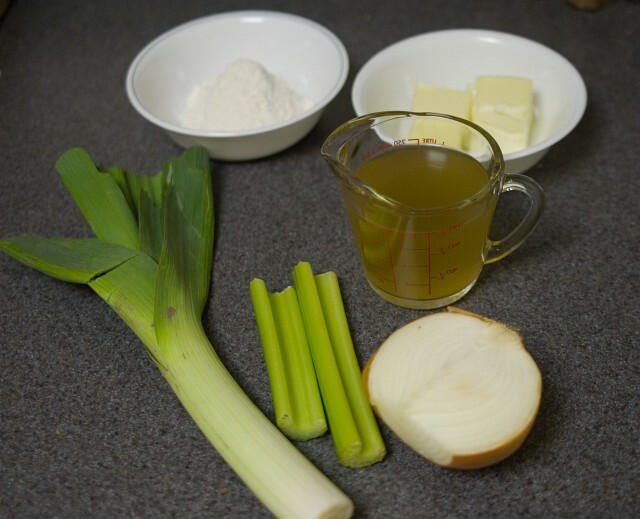 Start by assembling the ingredients needed for the basic soup. You'll need about 1/3 cup (70 g) flour, 4 ounces (110 g) butter, 1 cup (235 mL) chicken broth or stock, 4 ounces (110 g) diced onions (about 1/2 large yellow onion), 2 oz. (55 g) celery, 2 oz. 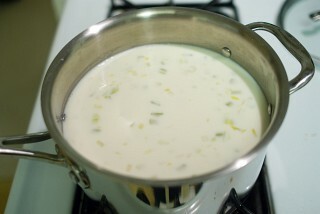 (55 g) leeks, 7 cups (1.65 L) whole milk (not pictured). You'll also need to have 12 to 16 ounces (340 to 450 g) button mushrooms, 1/4 teaspoon (0.4 g) dried, ground tarragon, 1/2 cup (120 mL) heavy cream, lemon juice, salt, and pepper for finishing the recipe. Start by washing the leeks. Often, mud and dirt will get trapped in the layers of the leek, so special care should be taken to wash them thoroughly. The easiest way to do this is simply to break the leeks apart under running water and use your fingers to help wash the dirt away. 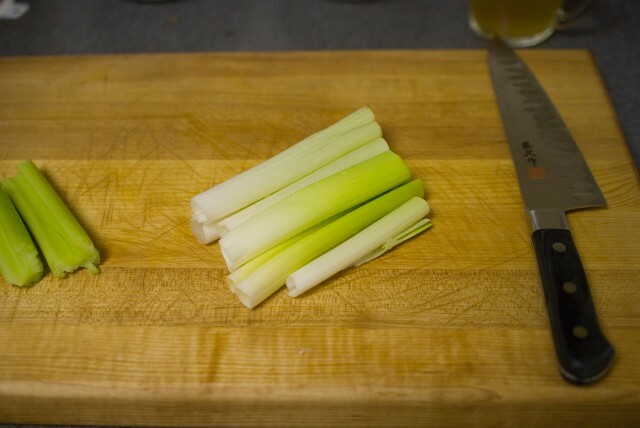 The celery should also be rinsed and deveined. Chop off the green tops, leaving the base of the leeks to make a total of about 2 ounces. 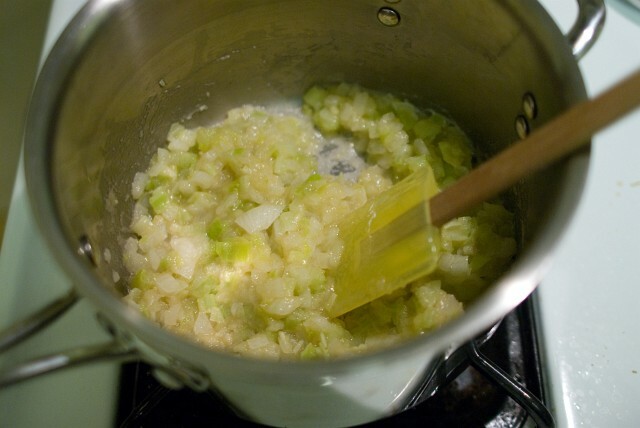 Dice the leeks, celery, and onion. This combination of vegetables is often called a white mirepoix (while a "normal" mirepoix substituting carrots for the leeks). Melt the butter in a 3-1/2 quart or larger pot over low heat. Add the onions, celery, and leeks to the melted butter and turn the heat up to medium-low. Stir the white mirepoix as it sweats until the onions are translucent, about 6 minutes. 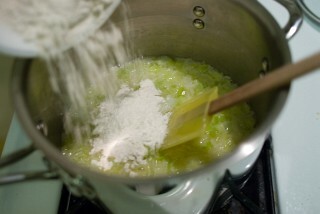 Add the flour to the mixture and continue to stir and cook over medium-low heat. Cook for about twelve minutes. The flour mixture should have taken on a slightly yellowed appearance at this point. While stirring, slowly pour the chicken broth into the pot. After all the broth has been incorporated into the flour mixture, keep stirring until there are no more lumps. Now, slowly add milk to the pot. To keep from forming lumps, you'll want to pour a little milk at a time. Slowly pour about 1/2 cup milk into the pot and stir until it's been fully integrated into the flour. Repeat with 1/2 cup milk at a time until four cups of milk have been stirred in. At that point, it should be fine to pour in the last three cups of milk without lumps forming. 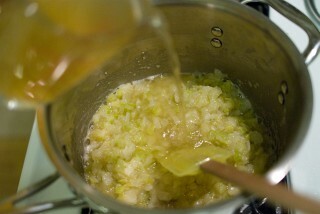 Bring the soup to a full boil, then simmer for 45 minutes (until smooth and thickened). In the meantime, prepare the ingredients for the final part of the recipe: 12 to 16 ounces (340 to 450 g) button mushrooms, 1/4 teaspoon (0.4 g) dried, ground tarragon, and 1/2 cup (120 mL) heavy cream. Lemon juice, salt, and pepper will be used for seasoning as well. Cut all the mushrooms into a fine dice. 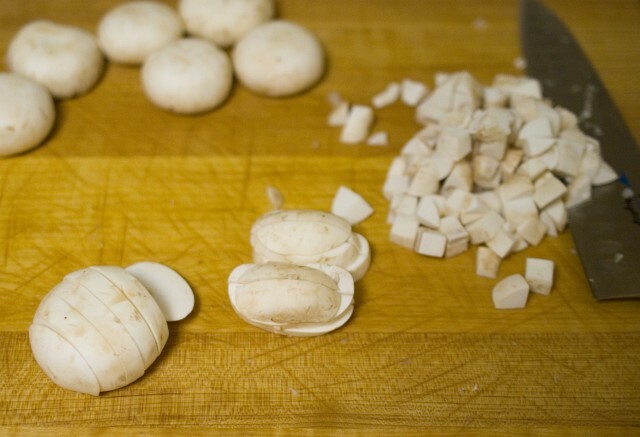 It's important to get the mushrooms cubes to be as uniform as possible so they will cook evenly. It also makes the final soup more attractive. Set the mushrooms aside as the soup simmers. Once the soup has simmered for 45 minutes, it can be chilled and refrigerated to finish the soup at a later time (up to three days). When it is time to finish the recipe, just reheat the soup until simmering temperature and continue the recipe from here. Add the 1/4 teaspoon tarragon to the soup and stir in. Add all the diced mushrooms to the soup and stir until evenly mixed. Turn off the heat and stir in 1/2 cup heavy cream. Add lemon juice, salt, and pepper to taste. For my ingredients, I found that 1 teaspoon lemon juice, 1 teaspoon table salt, and 1/2 teaspoon fresh ground pepper was just right. Subject: Great recipe- what about using coconut milk? Hi, first I'd like to say that I am truly looking forward to making this soup, I've been a big fan of everything mushroom since I first started to appreciate them in my late teens. 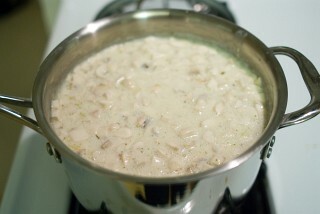 Now, I don't think heavy soups (that is soups with heavy cream and a lot of milk) are good for weekly consumption and I'm today a big fan of using some milk substitutes instead, do you, or any of your readers, know of a good mushroom soup that does not contain any heavy cream, or better yet, any milk? There might be a way to experiment with this recipe, and that's something I plan to do .. just after I've tried the original! Regards from Iceland, Omarkj. Any reason why you feel that milk would be worse than coconut milk? hmmm... i'm not sure coconut milk is a good substitute for milk for this recipe. coconut milk has quite a strong (and usually sweet!) flavor, especially powdered or canned ones (as opposed to squeezing it fresh from mature coconut.) I believe it would overpower the mushroom. plus, coconut milk is high in fat. simmering fresh coco milk for so long(45mins!) will not thicken the soup, rather, the water content evaporates and you get coconut oil and coco solids left(add a chili pepper or two and you get a dish native to a province here! YUMM! but that's another story.). this substitution will require a lot of overhauling from the original recipe. your comment made me think of soymilk, which i've been working on using as dairy substitute for several recipes. fresh strong soymilk is good, but can't also be simmered for very long, as it tends to get grainy. neither will it thicken. 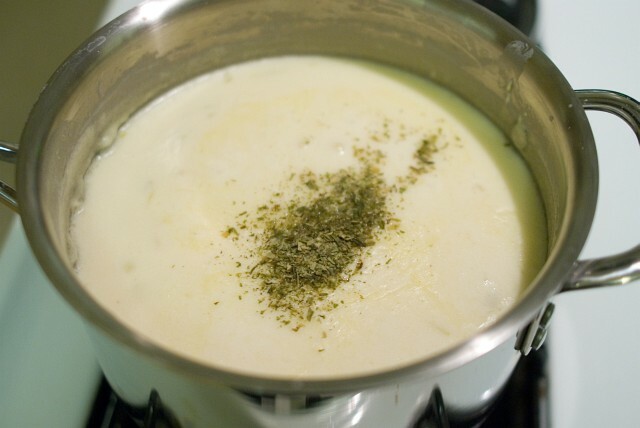 some people(who are avoiding the fat in creams) use mashed or milled boiled potatoes to thicken soups. this might work better if you want to avoid dairy. 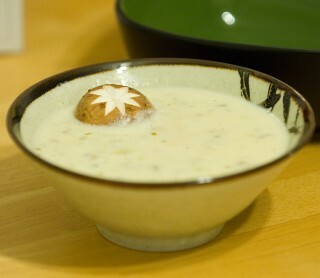 or, you can opt for a clear mushroom soup. :) which is actually very good for you and it's a staple in many asian-oriental cuisines. you can even use Mr. Chu's recipe with just minor adjustments. Let me know if i can help. I am going to have to make this soup over the weekend! Omarkj, mushroom barley soup is a hearty alternative to a cream based soup. I usually saute up a mix of whatever mushrooms are looking good at the store and some shallots with olive oil until everything is caramelized. Add some barley and saute until it smells nutty. Follow up with some chicken or vegetable stock, thyme, and bay leaf, simmering until the barley is tender. Sometimes I add carrots and parsnips or some parsley and chervil, depends on my mood. Healthier than the cream based, but I love a cream based soup from time to time. As a side note, evaporated milk sometimes is a decent, though not as tasty substitute for cream. It will give some of the same consistency while maintaining most of the same flavor. I agree with earlier comment that coconut milk would probably overpower the mushroom flavour. Not to mention that it would probably be a lot "heavier" with coconut milk than with milk, even whole milk! Shoot. I knew I forgot something in the article. It makes about 3 quarts (10 sizable servings). To keep from forming lumps, you'll want to pour a little milk at a time. Slowly pour about 1/2 cup milk into the pot and stir until it's been fully integrated into the flour. Using a wire whisk to incorporate the milk will help to avoid lumps forming. Subject: Re: Great recipe- what about using coconut milk? ...do you, or any of your readers, know of a good mushroom soup that does not contain any heavy cream, or better yet, any milk? This recipe would probably still be delicious if you simply replaced all or some of the milk with stock and reduced or omitted the cream. Just one cup of milk and a dash of cream, in combination with the thickening effect of the flour, would give a convincingly creamy taste. 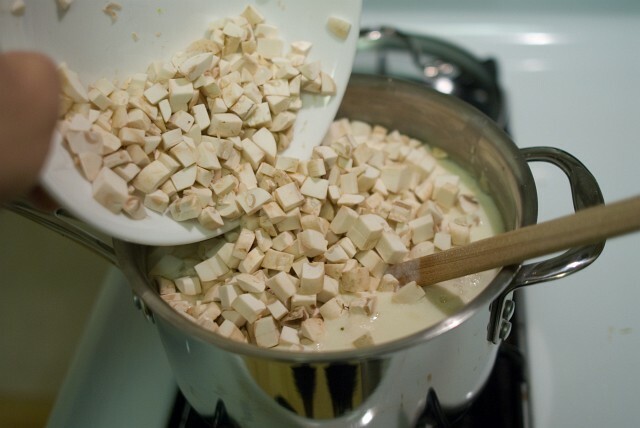 Roasted cashewnuts, pur�ed with water until very smooth, make an excellent replacement for milk in soups. To replace the cream, you could try liquidizing silken tofu with a dash of vegetable oil. Be careful not to allow the soup to come to the boil after you have added the tofu, as it may"split". Just a suggestion that I tried in mushroom soups before. You don't need to get all fancy with the "hoity toity" mushrooms, but baby bellas are similar in size and texture to button mushrooms, but give the soup a bit of a heartier flavor. Or, roasting the button mushrooms first also brings out the mushroom as the primary flavor. Just wish that the Recipe Card would have printed on one page. Don't you think an engineer could figure this part out? Just wish that the Recipe Card would have printed on one page. I assume you're using Internet Explorer since it didn't print. IE has always had a lot of difficulty printing tables in webpages. I haven't tried IE 7 yet, but I'm hoping they'll fix this. 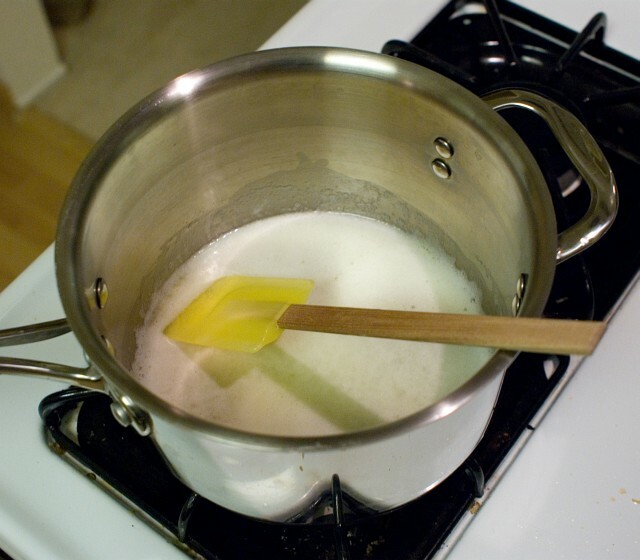 not only will whisking help when adding milk, but heating the milk up prior to adding it will too. 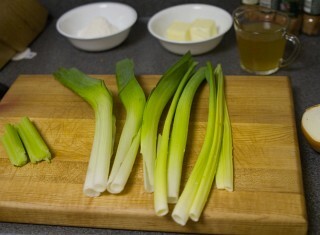 The celery should also be rinsed and deveined. This statement really confused me -- I thought to deveine must be some American term for a particular type of celery perparation with which I was not familiar. A quick search on Google lead me to the French word d�veine meaning rotten luck, which confused me even more! It suddenly struck me that the word was in fact de-vein, as in to remove the tough veins from the celery. I prepared this soup last night for my son and me (hubby's not a big fan of mushrooms) and it was fantastic. I only lessened the amount of onions (I'm not a big fan of onions). My only problem was the scalded milk at the bottom of the pan. I stirred frequently; though with a toddler running around, it was difficult to keep a steady vigil. Still, we have an electric range...could this have caused the burnt milk at the bottom? I know gas is best to cook with, but we're stuck with an electric range for now. How can I avoid this in the future? If your milk is scalding on an electric burner (because it will actually go to lower heat that a gas burner will), then your pan is probably too thin on the bottom. If you don't want to spring for a thicker bottomed pan, then place a cast iron skillet that is wider than your pan on the burner first, then put the pan with the soup in it. I wouldn't do this until after just before you put the milk in -- it will slow down the earlier steps in the process. HINT: this is also a good idea for those of you with gas burners who want a very low simmer; the cast iron gives off an even heat that prevents the hot spots that happen when you place a pan directly on the gas burner. This recipie looks wonderful ... but the flour is just for thickening, right? If I wanted to make this soup but with fewer carbs, could I use another thickening agent (like xantham gum)? I know, the consistency may not come out right, so I might have to experiment with it a bit. 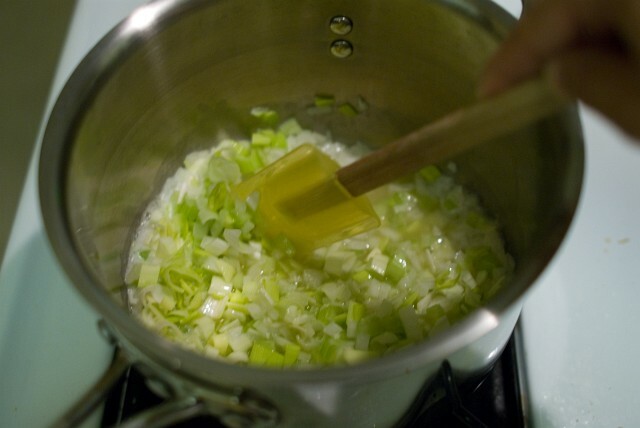 Don't forget to properly wash the Leeks or you'll have gritty soup!!!! I love cream of mushroom soup over rice, and this is fantastic that there's a recipe I can try at home. One question though - can the soup be frozen? Three quarts is a lot of soup, more than I would be able to eat by myself before it went bad. If you're looking to reduce the fat content, and cut out the cream, you might find (I haven't tried it) the the following trick works: to skim milk, add non-fat powdered milk until you have the consistency of cream. This is how they make non-fat "cream" for coffee, which you can also buy directly. I've generally had good success using soy milk in place of regular milk (I have a lot of vegan friends), and I agree with the suggestion of pureed cashew for the cream. Pureed pine nuts also work amazingly well. One other substitution comment: for those gluten-free cooks, potato or tapioca flour ought to work in place of the regular flour. I'd probably go potato, since I like the potato flavor in soup, but tapioca is plainer. I don't know, though, how to reduce the carbs. You can probably just leave it out, and have a thinner soup. I use xanthan for gluten-free baking, but haven't tried it in other contexts. Arrowroot is much more powerful than flour as a thickener, but breaks down upon boiling. I made it yesterday. It was delicious. My husband loves it. He couldn't believe it wasn't canned. I like the mushroom garnish you have in the bowl! So, I tired to make one like it and it was a disaster... could you give me a little tip? I blanched some cremini for a couple minutes in fully simmering water, then removed them and allowed them to cool for a minute so I could handle them. Then I took one and used a paring knife to cut the grooves. Just hold the knife over the mushroom cap and angle it 45 degrees. Then press the knife genlty down onto the cap so it cuts in (I don't use a slicing motion for this). Then I pull out the knife and angle it -45 degrees and press in removing a sliver of the mushroom cap. I repeated two more times to form a six pointed star. The soup is great and the recipe format is so simple and concise. So enjoy. For the adventerous at heart: to give the soup a hearty flavor, try adding a couple of ounces of fine scotch to the veggies just as you are finished cooking them. This is similar to de-glazing a pan with wine after cooking meat. The flavor of the whiskey complements the flavors of the onions, leeks, and mushrooms. I was amazed at the complexity of the flavor. Enjoy. It is not entirely accurate to qualify this recipe with : "has the taste and consistency of the soup everyone is familiar with". You really mean "everyone in the USA who was brought up with Campbell's canned soup." Most of my neighbors here in the SW of France wouldn't quite get it. Do you have any suggestions about using morel mushrooms instead of button mushrooms? They are a tougher mushroom and I wonder if they would need to be cooked considerably longer than buttons. Subject: where is the milk?!? you f#king discriminator! do you have something against dairy products?!? racist! Subject: Re: where is the milk?!? do you have something against dairy products?!? This recipe has 7 cups whole milk and 1/2 cup heavy cream... am I missing something? Subject: Treat this the same as the canned version? Hello! What a great idea you have here! I can't wait to try this. Now, do I treat this as if it were the same as the canned version? Meaning if I were to be making a recipe that calls for a can of cream of mushroom soup and then a can of water or milk, do I still add the milk or water that the recipe is calling for? Subject: Re: Treat this the same as the canned version? The problem is that this actually makes soup. The cans are (usually) condensed, so you'll have to take that into account. I don't have a can handy right now so I don't know how much liquid to subtract from the recipe. there's a new product on the market called hemp milk. i've found through brief experimentation it has enough of a creamy quality and fatty mouth feel to take the place of milk without the allergy risk of say soy milk. the hemp milk can be reduced to a condensed milk consistency and has a delicious result.also there are gluten free alternatives for the flour that are blends of various flours together. the ones with tapioca in the blend make for a nice rapid thickening. Is there anything hemp can't do? ten servings is alot for me....and i have little freezer space .... can it be canned in a pressure cooker? and if so would you know what pressure and how long to cook it in the pressure cooker? I am pleased to see the range of discussion revolving around the substitutions and techniques. I appreciate the comments on the cast iron supplement to prevent the scalding. I had the pleasure of being introduced to an electric stove for the first time this year and had to deal with this issue. I also like substituting things as this was very common practice by my mother with seemingly positive results. I tend to use corn starch and potato flour often as thickening agents, however this is without any attention being payed towards nutritional content or restrictions... Good recipe and good discussion. As the author lives in California, I don't think any claim was made with regards to understanding the taste or consistency of canned soup within the global marketplace. One may infer that this was a reference to Campbell's Soup. Perhaps you and your neighbors in France can look elsewhere for finding close to home canned-like recipes. Instead why don't you offer some constructive additions to a "Mushroom Soup Recipe" post or not bother next time. I have read most of the postings - perhaps not carefully enough - and I don't see any clarity to the freezing issue. I have been working to get preservatives out of my family's diet, but we love to make stroganoff the typical fast American way with condensed mushroom soup and wish to switch to a healthier option. Other recipes I have encountered say specifically not to freeze. Has anyone tried it? Thanks! An odd question. There really isn't anyway to get around making a non-dairy version of this is there? The girl I am dating wants cream of mushroom soup, but is extremelt allergic to cow's milk. Is there anyway to make a decent facsimile of this recipe without endangering her life? OMG that final picture with the mushroom soup with the little decorative mushroom on top ... that bowl.. i have the SAME EXACT BOWLS!! hahah but anyways - your soup looks amazing- the pictures and instructions are brilliant! We used to sell goat's milk to a family with a child allergic to cow's milk. Your girlfriend would know if she can drink goat's milk. It is now readily available in most grocery stores. Can I simply replace the mushrooms with broccoli to make cream of broccoli soup? substitute broccoli - or kale - or celery - or asparagus or . . .
the leeks are a flavoring addition of the onion family - if you don't like them, certainly you can substitute or omit to suite your own tastes. We do a lot of canning of most veggies and make a wonderful cream tomato soup and cream zucchini soup, both without using milk or cream. The tomato soup taste as good or better than that of Campbell�s from the 1940�s (I was raised on it). The Campbell�s was good then. On the question of canning cream we have never tried because from what we have read it will most likely always curdle or just look bad. I cannot say what Campbell�s does to their soup but just reading the ingredients label you can tell there must be some chemistry going on. Just eat it fresh made and enjoy. I have not yet tried this recipe but will get the ingredients and put it together, sounds great. Hello! I use a can of cream of mushroom soup for a couple of recipes. Could you please tell me what I would need to do to compare or make this more into a substitution for a can of cream of mushroom soup. I don't add water or milk in the recipes I need to make that use a can of cream of mushroom soup.....how do I make this version into a condensed can version? Thanks!! >>how do I make this version into a condensed can version? make the recipe as directed. simmer the soup for 10-20 hours on a ultra low flame until the water evaporates out and the soup reaches the consistency you want. alternately, put the hotplate and soup pan in your kitchen vacuum chamber, draw it down to 26" vacuum - that will speed up the process. 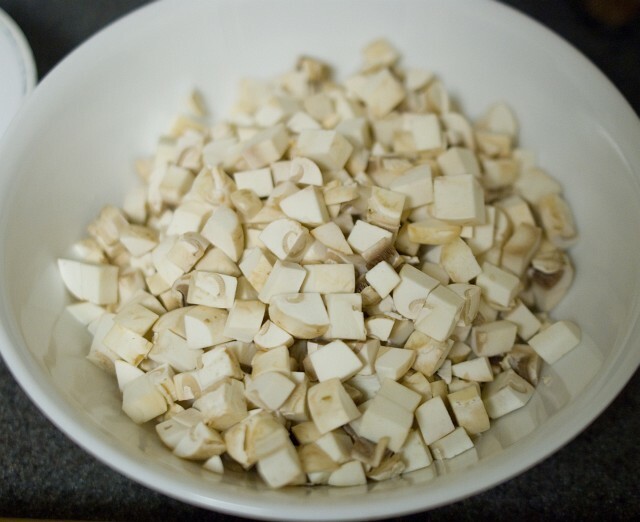 Putting raw diced mushrooms into the soup will cause them to float and they'll be reluctant to draw in the ingredients in the pot. It makes more sense to saute them first. Since this was on the home page today, and having just made a tasty mushroom-heavy vegetable soup last night, I couldn't resist reading through this recipe. Looks nice but as a vegetarian of 10 years whose diet relies on mushrooms (and indeed mushroom soups) as an important staple, I was disappointed to see the chicken broth in this recipe. I'm of the (biased) opinion that meatless soups should have a vegetarian broth--either vegetable broth, or much better yet for this type of soup, a mushroom broth which will add depth of flavor and a great earthiness. I will also add that there is a whole world of flavor outside of the white button mushroom. You needn't go looking for exotic or expensive shrooms (though kudos if you do), but try using half white button and half easily-obtainable crimini ("baby bella")--again...depth and earthiness. I usually use the white buttons for filler and others for flavor, especially if I'm making a "quick" mushroom soup to be served right away. Very tasty! As with the last comment, I don't puree but I do sautee the mushrooms. Hi Michael. I'v recently started trying out recipes and I enjoy reading your blog. In this post, you have mentioned how you tried out various recipes before you zeroed in on this particular one. I am really interested in knowing the quantities of ingredients you used in testing recipes. Do you start out with ingredient quantities same as in the recipe you've mentioned above? Or do you start small and then amp it up once you know you are going in a good direction? If you do indeed start small and then build up, is there some sort of a thumb rule for increasing ingredient quantities accordingly? I know this is a very general question, but I'd be interested in what your thoughts are on this topic. Thanks and hope you guys are settling down great in Austin. Do you start out with ingredient quantities same as in the recipe you've mentioned above? I try to use the same quantity of ingredients in the original recipe. it's the opposite of a pressure cooker - a closed chamber where the interior pressure is reduced below normal atmospheric pressure. at lower air pressure liquids will boil - turn from liquid to vapor - at a lower temperature, or faster at the same temperature. the extreme example is "freeze drying" - ala (some) instant coffee - a frozen liquid is put under vacuum. the frozen water 'sublimes' - leaving just the solids. sublimes' means goes from a solid state (i.e. ice) to a vapor state without going thru a liquid phase. To those asking about making this a condensed version, this is actually fairly simple. Just reduce the liquid portion to about half, but keep the fats and flour the same. Should you decide to add any liquid later to make the full soup or whatever, you just add the remaining half. It may be a bit difficult (only at first) because it does get very thick, but the end result is the same. Just reduce the heat a bit to prevent scorching. After you've done it a couple of times, it becomes very easy. If you absolutely must freeze, then I'd just eliminate the cream and add that only when ready to use it. You'll have to do a little math to figure it out (e.g., whether you're doing condensed or the full soup). 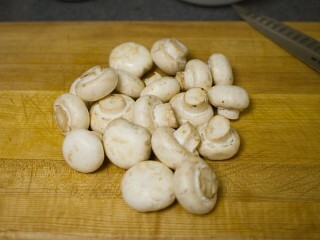 Also if you plan on using mushrooms, add those into the soup, let it simmer a few minutes, then freeze. It's all about just rearranging the recipe according to what you want to do with it. Oh and 1 condensed can of Campbell's is 1 1/4 cups undiluted. That may be helpful for any recipe. I am so glad people are talking about substitutions. Frankly, this is one of the few cooking sites NOT dedicated to allergy issues that have people actively asking such questions and actually getting reasonable answers...even from other commenters. Cool! flavor base at that point. As for vegetarians being disappointed... well, the sad truth is, the overwhelming majority of the folks in the food world are omnivores. You can protest this trend by substituting EVERY instance of meat or meat based products with vegetarian products... and make it taste wonderful. I'm serious. I was one for five years. Working out your frustration in the kitchen is frankly a lot more satisfying than harassing those who think their canines are useful for something. This means you can shame them (without rebuke!) with your awesome re-worked recipes, and make those vegetarian bashers eat their words about tasteless and "weak" food. Hey... if the Brahmans in India can do it... why not here? I mean... Butter. Milk. Cream. Why pick on the chicken broth? That would be the easiest to replace. If you don't want to make your own, Pacifica does an amazing organic mushroom broth that would sing in this recipe. Early on in these comments it was asked if coconut milk was a good replacement for the cream. That was a few years ago. Now, there are a number of coconut milk products available in the market place. The sweet, coconutty flavored milks are most likely creme of coconut: as widely known for tasty beverages. Also, the fats in coconut are pretty good for you as long as you don't cook them too much. I am on a restricted fat diet, and my dietitian mentioned unprocessed coconut as one of the good fats... as long as it wasn't overheated. Then there are the canned coconut milk types mostly used for Thai and East Asian and Indian cuisines. These might work, though you want to make sure they aren't sweetened. Mushrooms and coconut go very well together, actually. One of my favorite cram sauces involves mushrooms fried up with coconut milk as the only thickener. Great on Kangaroo Steaks. Thank you, Australia! My concern for using type number two is that the coconut solids might separate over time. This wouldn't store well. Then there is the third type, which is a coconut milk which is formulated and marketed specifically to allergy sufferers. It's fat to liquid ratio are normalized to roughly that of whole milk. Personally, I think it's richer... not quite as rich as half and half... but pretty close. While it is identifiably coconut milk, it does not scream the coconut flavor or come off sweet. It helps to buy the unsweetened variety, but even the sweetened type could be used for savory purposes, or even for non-coconut flavors. then adding the coconut milk last as one does the cream for finishing. This way, the coconut milk gets heated but not boiled, and presumably stays reasonably healthy. Also, I know for a fact that hemp milk and coconut milk together taste great. I make milk-free eggnog for the holidays out of this duo. However, this mix by itself would also be good flavor-wise for savory applications as well. IF the coconut milk is not rich enough for my purposes, I'll use an old Thai trick and put in come finely blended macadamia nuts. I'd use candlenuts if I had them, but hey, I live in the US. I'll report back here if people are interested once I get results. Could you put portions into FoodSaver, e.g., bags or containers and do the vacuum sealing thing? If I'm understanding it correctly, that would allow you to store in the fridge for extended periods. I bought my system for parcelling up roasts, like ham that doesn't freeze well, so I could store them safely in the fridge instead. Wouldn't that work for a cream soup or sauce? In a word: no. Do the vacuum sealing thing for frozen foodstuffs which can't endure freezer burn. A ham or roast in the fridge ain't gonna last very much longer shrink wrapped in FudSaver than it would in newspaper, though it will look much prettier when it gives you ptomaine. Only exception I can think of is for a dry grated cheese, like Parmesan; and then you need to use a mason jar and a lid -- and the optional, additional attachment. Low cost vacuum sealers work by sucking air out of special bags with ridges on one side which act as air channels. The problem with this technique is that air pressure outside of the bag will try to squeeze everything out of the bag that can be squeezed out through the plastic channels... including all liquids. The only way to use a FoodSaver or equivalent vacuum sealer is to vacuum seal them in special FoodSaver containers or in mason jars with the mason jar attachment. That will help extend the life of the soup in the fridge by a few weeks if everything was sterilized. Good recipe, but I do it a bit differently. I like to sweat the onion/leek mixture in butter and olive oil, and add either diced celeriac or potato. After 15-20 minutes sweating, add the stock of choice and boil/pressure cook until all tender. Meanwhile, finely chop mushrooms and sweat in a little butter and olive oil. Combine the two and blend/liquidise. 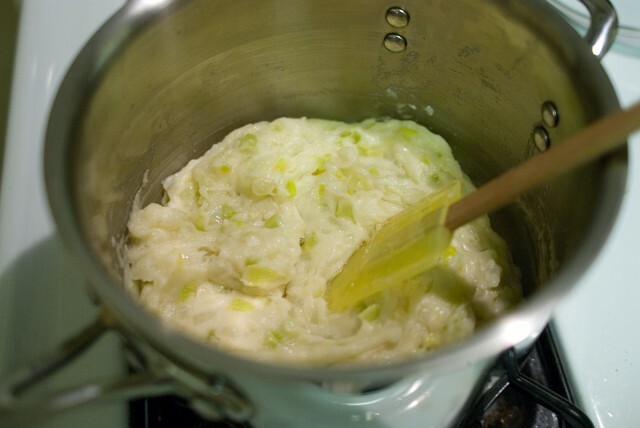 No flour, because the celeriac or potato absorbs the fat. Add creme fraiche or cream to taste, or indeed some coarsely chopped mushroom as done here. Chopped parsley is also good at the end.